Will learners use your eLearning? This guide will help you make sure they do. Here at Engage in Learning, we want to make your life as easy as possible. 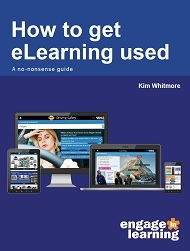 So to get great uptake on your eLearning resources this guide will help. We know that companies need eLearning solutions that are specific to their need, training budget and learning culture, which is why we work in partnership with our customers to ensure the right solution is provided. We also offer practical help and guidance on how to effectively engage staff in the learning journey. Once you’ve downloaded and read our free eBook you will be in the best position to begin creating an in-house communication strategy that takes into account staff needs as well as the needs of your organisation. By understanding and aligning organisational needs and the training needs of individual employees, you can ensure that you are encouraging participation in an excellent eLearning environment that engages and promotes success through a fully automated and relevant learning experience. Contact us now to make your next eLearning project a great success!